The Srimad Bhagavad Gītā (Sanskrit: भगवद्गीता, "Song of God") is a Sanskrit text from the chapter Bhishma Parva of the Mahabharata epic, comprising 700 verses. The Bhagavad Gita is also called Gītopaniṣad as well as Yogupaniṣad, implying its status as an 'Upanishad'. Since it is drawn from the Mahabharata, it is a smṛti text, however referring to it as an Upanishads is intended to give it status comparable to that of śruti, or revealed knowledge. The Srimad Bhagavad Gita is a dialogue between Lord Krishna and Arjuna, narrated in the Bhishma Parva of the Mahabharata. It comprises eighteen discourses of a total of 701 Sanskrit verses. A considerable volume of material has been compressed within these verses. On the battlefield of Kurukshetra, Sri Krishna, during the course of His most instructive and interesting talk with Arjuna, revealed profound, sublime and soul-stirring spiritual truths, and expounded the rare secrets of Yoga, Vedanta, Bhakti and Karma. All the teachings of Lord Krishna were subsequently recorded as the Song Celestial or Srimad Bhagavad Gita by Bhagavan Vyasa for the benefit of humanity at large. The world is under a great debt of gratitude to Bhagavan Vyasa who presented this Song Celestial to humanity for the guidance of their daily conduct of life, spiritual upliftment and Self-realisation. Those who are self-controlled and who are endowed with faith can reap the full benefit of the Gita, which is the science of the Soul. The Gita Jayanti (birthdate of the Gita) is celebrated throughout India by the admirers and lovers of this unique book on the 11th day (Ekadashi) of the bright half of the month of Margasirsha according to the Hindu almanac. It was the day on which the scripture was revealed to the world by Sanjaya. In all the spiritual literature of the world there is no book so elevating and inspiring as the Gita. It expounds very lucidly the cardinal principles or the fundamentals of the Hindu religion and Hindu Dharma. It is the source of all wisdom. It is your great guide. It is your supreme teacher. It is an inexhaustible spiritual treasure. It is a fountain of bliss. It is an ocean of knowledge. It is full of divine splendour and grandeur. The Gita is the cream of the Vedas. It is the essence of the soul-elevating Upanishads. It is a universal scripture applicable to people of all temperaments and for all times. It is a wonderful book with sublime thoughts and practical instructions on Yoga, devotion, Vedanta and action. It is a marvellous book, profound in thought and sublime in heights of vision. It brings peace and solace to souls that are afflicted by the three fires of mortal existence, namely, afflictions caused by one’s own body, those caused by beings around one, and those caused by the gods. The date of composition of the text of the Bhagavad Gita is not known with certainty, but is widely accepted as 5000 years ago: during Mahabharata times. Showing great compassion for all living entities Shri Krishna’s lila avatar and literary incarnation Krishna Dvaipayana Vedavyasa composed the authentic historical treatise known throughout creation as the Mahabharata. The eighteen chapters of the Bhagavad-Gita are found in the Bhisma-parva, chapters 25 to 42 of the Mahabharata and they are the exact words that Shri Krishna spoke in Sanskrit on the battlefield of Kurukshetra, India over five thousand years ago in 3137 B.C. The proof that the Mahabharata is definitely an authentic historical treatise and not allegorical or mythological is verified in the Srimad Bhagavatam, Canto 1, chapter 4, verse 25 as follows. Out of compassion the great sage Vedavyasa thought it wise that all mankind achieve the ultimate goal of life. Thus he compiled the historical treatise known as the Mahabharata for the women, laborers and friends of the brahmanas. The Bhagavad-Gita chronology is given in Mahabharata, Santi-parva, CCCXLVIII. In the beginning of Treta yuga the supreme science of Bhagavad-Gita was delivered by the sun-god Vivasvan to Vaivasvata Manu the father of mankind who gave it to his son King Iksvaku the ruler of the planet Earth. The Supreme Lord Krishna said: I instructed this supreme imperishable science unto the sun-god Vivasvan and he instructed it unto Vaivasvata Manu the father of mankind who instructed it to his son King Iksvaku, ruler of all the Earth. King Iksvaku was the sovereign ruler of Earth at the time he received the supreme science of the Bhagavad-Gita. He was the progenitor of the solar Raghu dynasty in which the Lord Krishna's avatar as Rama appeared in Ayodhya also in Treta yuga. If we calculate we know that the present age we are in is Kali yuga in which 5000 years have transpired. Before this was Dvapara yuga which had 800,000 years and before this was Treta-yuga which began 1,200,000 before Dvapara-yuga. So from this Vedic information it can be determined that King Iksvaku received the Bhagavad-Gita in this world at the very least 2 million years ago. Going even further, the lifespan of Vaivasvatu Manu who is the current and seventh Manu in this kalpa is calculated in the Vedic scriptures as being 308,571,428 solar years of which 120,400,000 have transpired. Since the Bhagavad-Gita was given to the sun-god Visvasvan before the current Vaisvasvatu Manu was born then it can be understood that the Bhagavad-Gita was spoken to him at least 120 million 400 thousands years ago. Going even more further than this we know that one kalpa is calculated in Vedic scriptures as being 4 billion 300 million years. There are 14 Manus is this time period of a kalpa of which our current Vaivasvatu is the seventh Manu. So there were six previous Manus before him and they also received the supreme eternal science known as Bhagavad-Gita. So if we multiply 6 times 308,571,428 which is the time of existence for one Manu we arrive at the time span of 1,851,428,568 solar years and if we add the 120,400,000 years from our current Vaisvasvatu the seventh Manu. It can be determined the Bhagavad-Gita was also spoken 1 billion, 971 million, 828 thousand 568 years ago. The supreme science of the Bhagavad-Gita is unable to be understood by unevolved beings of impure consciousness. This supreme science of the Bhagavad-Gita is periodically given by the Supreme Lord Krishna or His scriptually revealed incarnations or by his authorised representatives through the auspices of disciplic succession in one of the four bonafide sampradayas being the Brahma Vaisnava Sampradaya, the Sri Vaisnava Sampradaya, the Rudra Vaisnava Sampradaya and the Kumara Vaisnava Sampradaya. Having manifested at the beginning of each cyclic creation it eternally manifests again and again with the birth of every Brahma. The content of the text is a conversation between Shri Krishna and Arjuna taking place on the battlefield of Kurukshetra just prior to the start of a climactic war. Responding to Arjuna's confusion and moral dilemma, Krishna explains to Arjuna his duties as a warrior and Prince and elaborates on a number of different Yogic and Vedantic philosophies, with examples and analogies. This has led to the Gita often being described as a concise guide to Hindu philosophy and also as a practical, self-contained guide to life. During the discourse, Krishna reveals his identity as the Supreme Being Himself (Bhagavan), blessing Arjuna with an awe-inspiring glimpse of His divine absolute form. 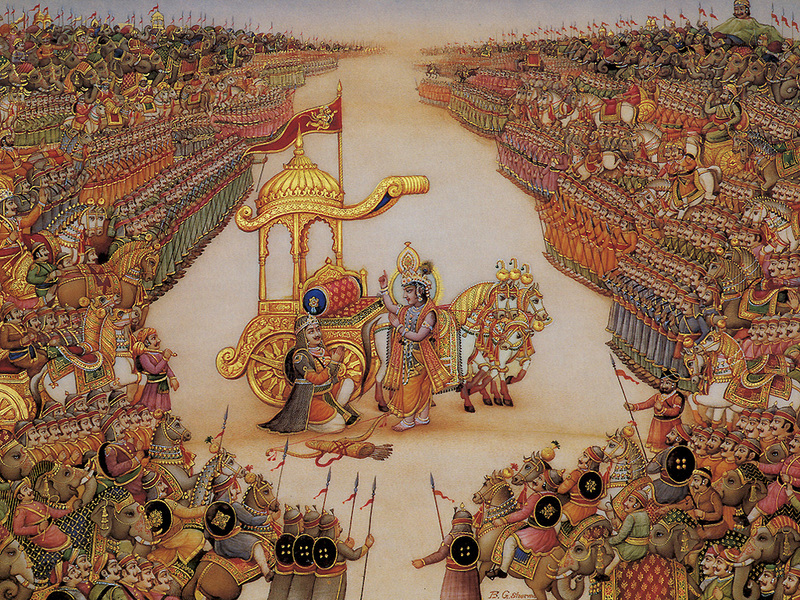 The discourse on the Bhagavad Gita begins before the start of the climactic battle at Kurukshetra. It begins with the Pandava prince Arjuna, as he becomes filled with doubt on the battlefield. Realising that his enemies are his own relatives, beloved friends and revered teachers, he turns to his charioteer and guide, Krishna, for advice. Krishna counsels Arjuna on the greater idea of dharma, or universal harmony and duty. He begins with the tenet that the soul is eternal and immortal. Any 'death' on the battlefield would involve only the shedding of the body, but the soul is permanent. Arjuna's hesitation stems from a lack of right understanding of the 'nature of things,' the privileging of the unreal over the real. His fear and reticence become impediments to the proper balancing of the universal dharmic order. Essentially, Arjuna wishes to abandon the battle, to abstain from action; Krishna warns, however, that without action, the cosmos would fall out of order and truth would be obscured. In order to clarify his point, Krishna expounds the various Yoga processes, and understanding of the true nature of the universe. Krishna describes the yogic paths of devotional service, action, meditation and knowledge. Fundamentally, the Bhagavad Gita proposes that true enlightenment comes from growing beyond identification with the temporal ego, the 'False Self', the ephemeral world, so that one identifies with the truth of the immortal self, the soul or Atman. Through detachment from the material sense of ego, the Yogi, or follower of a particular path of Yoga, is able to transcend his/her illusory mortality and attachment to the material world and enter the realm of the Supreme. It should be noted, however, that Krishna does not propose that the physical world must be forgotten or neglected. Indeed, it is quite the opposite: one's life on earth must be lived in accordance with greater laws and truths, one must embrace one's temporal duties whilst remaining mindful of a more timeless reality, acting for the sake of action without consideration for the karmaphal (karmic fruits, whether bitter or sweet). Such a life would naturally lead towards stability, happiness and, ultimately, enlightenment. To demonstrate his divine nature, Krishna grants Arjuna the boon of cosmic vision (albeit temporary) and allows the prince to see his 'Universal Form' (this occurs in the eleventh chapter). He reveals that he is fundamentally both the ultimate essence of Being in the universe, and also its material body, called the Vishvarupa ('World Form'). In the Bhagavad-Gita Krishna refers to the war about to take place as 'Dharma Yuddha', meaning a righteous war for the purpose of justice. 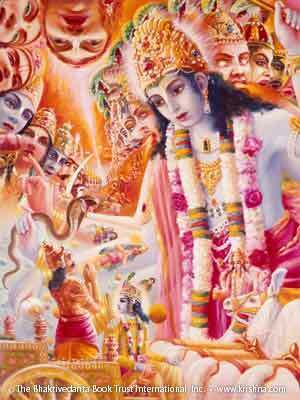 In Chapter 4, Krishna states that he incarnates in each age (yuga) to establish righteousness in the world. Arjuna requests Krishna to move his chariot between the two armies. When Arjuna sees his relatives on the opposing army side of the Kurus, he loses courage and decides not to fight. After asking Krishna for help, Arjuna is instructed that only the body may be killed, while the eternal self is immortal. 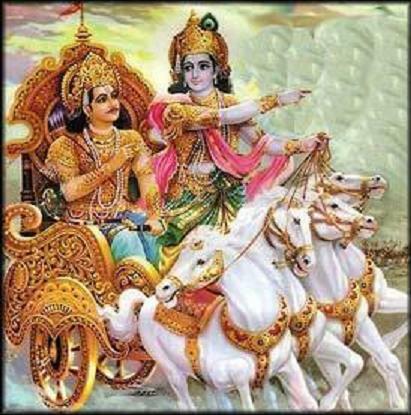 Krishna appeals to Arjuna that as a warrior he has a duty to uphold the path of dharma through warfare. Arjuna asks why he should engage in fighting if knowledge is more important than action. 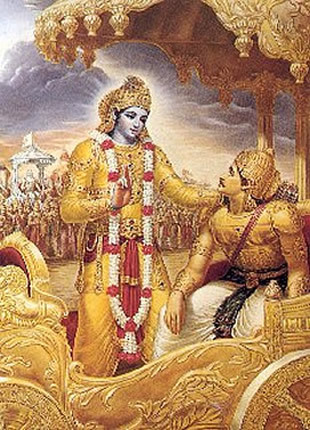 Krishna stresses to Arjuna that performing his duties for the greater good, but without attachment to results is the appropriate course of action. Arjuna asks Krishna if it is better to forgo action or to act. Krishna answers that both ways may be beneficent, but that acting in Karma Yoga is superior. Krishna describes the correct posture for meditation and the process of how to achieve samadhi. Krishna teaches the path of knowledge (Jnana Yoga). Krishna defines the terms brahman, adhyatma, karma, adhibhuta and adhidaiva and explains how one can remember him at the time of death and attain his supreme abode. Krishna explains panentheism, "all beings are in me" as a way of remembering him in all circumstances. Krishna describes how he is the ultimate source of all material and spiritual worlds. Arjuna accepts Krishna as the supreme being, quoting great sages who have also done so. On Arjuna's request, Krishna displays his "universal form" (Viśvarūpa), an epiphany of a being facing every way and emitting the radiance of a thousand suns, containing all other beings and material in existence. Krishna describes the process of devotional service (Bhakti Yoga). Krishna describes nature (prakrti), the enjoyer (purusha) and consciousness. Krishna explains the three modes (gunas) of material nature. Krishna describes a symbolic tree (representing material existence), its roots in the heavens and its foliage on earth. Krishna explains that this tree should be felled with the "axe of detachment", after which one can go beyond to his supreme abode. Krishna tells of the human traits of the divine and the demonic natures. He counsels that to attain the supreme destination one give up lust, anger and greed, discern between right and wrong action by evidence from scripture and thus act rightly. Krishna tells of three divisions of faith and the thoughts, deeds and even eating habits corresponding to the three gunas. The Gita addresses the discord between the senses and the intuition of cosmic order. It speaks of the Yoga of equanimity, a detached outlook. The term Yoga covers a wide range of meanings, but in the context of the Bhagavad Gita, describes a unified outlook, serenity of mind, skill in action and the ability to stay attuned to the glory of the Atman (Self) and the Bhagavan (Supreme Being). According to Krishna, the root of all suffering and discord is the agitation of the mind caused by selfish desire. The only way to douse the flame of desire is by simultaneously stilling the mind through self-discipline and engaging oneself in a higher form of activity. However, abstinence from action is regarded as being just as detrimental as extreme indulgence. According to the Bhagavad Gita, the goal of life is to free the mind and intellect from their complexities and to focus them on the glory of the Self by dedicating one's actions to the divine. This goal can be achieved through the Yogas of meditation, action, devotion and knowledge. In the sixth chapter, Krishna describes the best Yogi as one who constantly meditates upon him - which is understood to mean thinking of either Krishna personally, or the supreme Brahman - with different schools of Hindu thought giving varying points of view. 2. paramatma - The Supreme Soul sitting in the heart of every living entity. 3. bhagavan - God as a personality, with a transcendental form. The Gita again and again emphasises that one should cultivate an attitude of non-attachment or detachment. It urges repeatedly that an individual should live in the world like water on a lotus leaf. “He who does actions, offering them to Brahman and abandoning attachment, is not tainted by sin as a lotus leaf by water”—V.10. Attachment is due to infatuation. It is the offspring of the quality of Rajas. Detachment is born of Sattwa. The former is a demoniacal attribute, the latter a divine one. Attachment is born of ignorance, selfishness and passion and brings with it death; detachment is wisdom and brings with it freedom. The practice of detachment is a rigorous discipline. You may stumble like a baby who is just learning to walk, but you will have to rise up again with a cheerful heart. Failures are not stumbling-blocks but steppingstones to success. Try to dwell always in your own Self. Abide in your centre. Think of the Self constantly. Then all attachments will die automatically. Attachment to the Lord is a potent antidote to annihilate all worldly attachments. He who has no attachments can really love others, for his love is pure and divine. “Therefore, without attachment do thou always perform action which should be done; for, by performing action without attachment man reaches the Supreme”—III.19. As the Gita contains subtle and profound teachings, you should study it under a qualified teacher, one who is established in the Absolute. Only when studied with great and intense faith, single-minded devotion and purity, will the truths contained therein be revealed unto you like a fruit on the palm of your hand. Good commentaries written by realised sages will also be of immense help to you. Worldly-minded individuals, however intellectual they may be, cannot grasp the essential teachings of the Gita. They enter into unnecessary discussions and useless debates. They cavil and carp at the teachings. Such ignorant people say: “There is no intimate connection between the verses. They are thrown in a disorderly manner. There is a great deal of repetition.” If they study the book with reverence and faith under a qualified teacher all their doubts would vanish. They will realise that there is a close connection between the verses in all the chapters. Repetitions in the Gita and the Upanishads are useful repetitions. They are best calculated to create a deep and indelible impression in the mind of the aspirant. Lord Krishna speaks from different levels of consciousness. In the Gita the word “Avyaktam” sometimes refers to primordial Nature and sometimes to the Absolute Para Brahman also. Therefore, the help of a teacher is necessary if you wish to know the right significance of the verses.